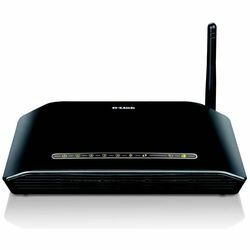 This Wireless N 150 ADSL2+ 4 port Ethernet Router connects a group of users to the Internet, allowing multiple computers in your home or office to share an integrated high speed ADSL2/2+ connection. It features four built-in Ethernet ports, firewall protection, and QoS for smooth and secure transfer of photos, files, music, video, and e-mail over the Internet. Features1. FAST INTERNET CONNECTION:Latest ADSL2/2+ standard provides Internet transmission of up to 24 Mbps downstream, 1 Mbps upstream2. HIGH-PERFORMANCE WIRELESS:Wireless N 150 technology is ideal for high-speed wireless connections, and is compatible with 802.11n/g/b wireless devices3. TOTAL SECURITY & QoS:Firewall protection, user access control, WPA/WPA2 wireless security and priority queues for smooth VoIP and multimediaDescriptionThis Wireless N 150 ADSL2+ 4 port Ethernet Router connects a group of users to the Internet, allowing multiple computers in your home or office to share an integrated high speed ADSL2/2+ connection. It features four built-in Ethernet ports, firewall protection, and QoS for smooth and secure transfer of photos, files, music, video, and e-mail over the Internet.